Last summer, my family and I visited our friends Mark and Lily, in King’s Beach, California. After we arrived and decompressed from our ten-hour drive, Lily prepared us a beautiful salad, full of fresh vegetables and quinoa. I had heard of quinoa, but had never tried it for the reasons of not knowing how to prepare it or with what to eat it. Mark, an acupuncturist, and Lily, a chiropractor own Lake Tahoe Wellness Center and Lily always has delicious healthy recipes to share. Quinoa, (pronounced keen-wah), is commonly thought to be a grain, but it actually a seed of a leafy plant related to beets and spinach. It was a staple of ancient Andes civilizations and the Incas referred to quinoa as “the mother grain.” The seeds are small and round and resemble couscous, but quinoa is not wheat, thus gluten-free. Quinoa is packed full of nutrients – B6, niacin, and thiamine, folic acid, zinc, phosphorus, magnesium, and iron- and is a good source of fiber. I especially like quinoa because one serving (1/2 cup) contains approximately 10 grams of protein. It is a complete protein, unlike wheat and rice, because quinoa contains lysine among its essential amino acids. 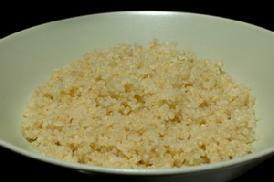 After rinsing and draining quinoa, it is prepared just like rice in a 2:1 ratio of water to quinoa. I sometimes substitute vegetable broth for water to add flavor. Quinoa can be eaten as a side dish, a good alternative to rice, or used in salads, soups, breads, or even as a breakfast cereal. I want to share Lily’s salad recipe. Since quinoa has a good balance of fat, protein, and carbohydrates, I always feel satisfied after eating this salad; it’s a meal in itself. This is the original recipe, but you can add the ingredients that you desire. I add in diced apples and carrots, and my husband throws in some walnuts and red bell peppers. I make it as a single serving or make a big bowlful to take to potlucks. I hope that you try Lily’s salad and enjoy the nutritional benefits and the savory rewards!